Successfully Added Digital Multimedia Player (MP3, MP4, Camera, Games, Large LCD) to your Shopping Cart. 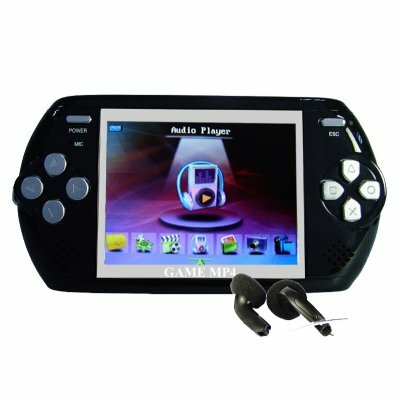 Digital media player (MP3, MP4) with 2GB memory, game player, camera, 2.8-inch LCD, and SD/MMC card slot. Do you want to get a new or replacement MP3/MP4 player but are tired of the limited functionality or outrageous prices seen in the "name brand" models these days? Well then, have we got the answer for you! This new portable media player (PMP) features a high quality 2.8 inch TFT LCD screen, 1.3MP digital camera, stereo speakers, plays NES video games, has an e-book reader, and of course plays MP3 and MP4 files (and without the need for proprietary software) with ease. All this and all the cables and earphones you need to start enjoying yourself right away. Everything that you want from your PMP is available with this low cost PMP, direct from China and available now at a direct to you low wholesale price. Versatile 2GB digital media player offering all of todays popular entertainment choices in one sleek package. Large 2.8 inch TFT LCD makes watching videos or reading a pleasure. Over 100 NES game ROM's are located on the included CD. More can be located on the internet. i bought this game for my daughter and she loves it . Excellent product for kids & high quality photos. you can no longer record tv from this product, because the features as changed, so it has no av in like in the old picture, and the old description of this page. The products is not that easy to use, because it seems that every features are working separately : i mean you have to escape the camera menu, to go to see pictures you took. or there is no way to reduce sound of games (or difficult to find where). Sometimes, you press 'enter' in different way (sometimes it's esc). It's seems also to have no way to mute the sound of the menu (sounds like the chord wav of windows error). And depending of the langages, this is not the good translation or it's not possible to read the whole sentence. This is a good gadget for persons who are not used to that kind of technology, or kids.